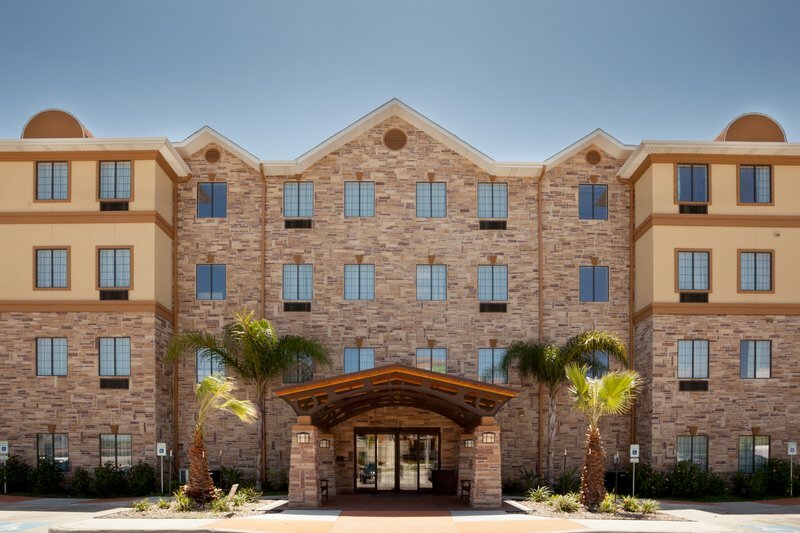 Guests Love Corpus Christi, Texas Upscale Extended Stay Hotel Conveniently located off HWY 358, the Staybridge Suites Corpus Christi Hotel boasts superior amenities and lux accommodations, along with the comforts of home. Guests at this Upscale Extended Stay Hotel receive first class service and top notch quality. From Monday to Wednesday, indulge in a complimentary evening light meal with wine and beer during our social receptions. Each morning, begin your day with our complimentary Hot Deluxe Breakfast, which includes our popular Texas shaped waffles. Our Extended Stay Hotel features, such as full kitchens in every guestroom, are a perfect fit for corporate relocations, project teams and long term or periodic visitors. Convenience is key at Staybridge Suites Corpus Christi. This Upscale Extended Stay Hotel is centrally located, only a few miles from several area beaches, including Corpus Christi Beach, Mustang Island, and JP Luby. We are a short drive from local attractions, such as the USS Lexington and Texas State Aquarium. Or, visit the newly renovated La Palmera shopping mall located only minutes away. Within walking distance, you will find several restaurants to choose from. Enjoy our SportsCourt, heated whirlpool, outdoor swimming pool as well as our hugely popular BBQ Pavilion. At Staybridge Suites Corpus Christi Hotel, you will find everything you need and much more. Cracker Barrel: Traditional recipes and quality ingredients like only the finest Russet potatoes. Of Course if you want, you can even make a meal out of our vegetables. And you know what happens if you eat your vegetables. Board Room: Elegant Board Room for up to 12 people. Fully equipped with LCD Projector and Screen. Space available to setup breakfast, lunch, or dinner. One of our local restaurant partners can set that up for you. Just call our Sales Department. Corpus Christi Country ClubThis par 72 Robert Trent Jones design is a finely manicured, private, member owned course. The subtle nuances of the courses greens and prevailing South wind are challenging and fun to play. USS LEXINGTONAll hands on deck for excitement! Step aboard the USS Lexington, a famous and truly massive naval aircraft carrier from World War II, featuring amazing rides in a flight simulator and the chance to climb behind the controls of a jet fighter. TEXAS STATE AQUARIUMTravel on an ocean adventure deep into the Gulf of Mexico without ever leaving the coastal shore at the Texas State Aquarium. Observe aquatic life from dolphins to jelly fish and learn about environmental conservation and wildlife rehabilitation. BEACHWhen you travel to Corpus Christi, you have an option to choose from several Beaches including McGee Beach, Corpus Christi Beach, South Packery Jetty Beach, Whitecap Beach, Bob Hall Pier, Padre Island National Seashore, and Mustang Island Beaches. MUSTANG ISLAND STATE PARKMustang Island State Park is about five miles from the bridge that crosses the Packery Channel when coming from North Padre Island. The facilities available for day use include picnic area, grills, fresh water rinse showers and restrooms. PADRE ISLAND NATIONAL SEASHOREOne of Corpus Christi's most striking attractions, the Padre Island National Seashore covers 130,000 acres of barrier island, home to sea turtles and spectacular bird watching. There's no better place to experience the charms of the Texas Gulf Coast.